Today our track team will host their only home meet so be sure to come on out and cheer them on. Field events start at 1pm, track events begin at 2pm. If you would like to volunteer to help, please see Mr. Plan. Prom will be held on Saturday, April 23rd from 8-11pm. Tickets cost $30 per individual, $50 per couple. The theme is Sunset Beach and prom will be held aboard a Major Marine Tours boat that goes to Thumb Cove. Tickets are on sale this week. 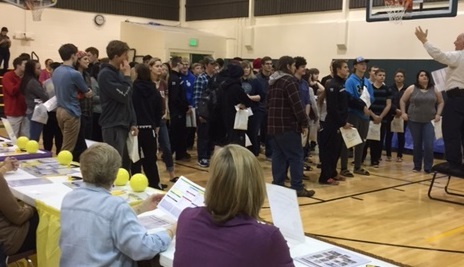 Thank you all volunteers for helping with the GET REAL Financial Fair.